The Elizabeth Hubert Malott Japanese Garden is also called Sansho-En (Garden of Three Islands). It is a place of serene beauty and harmony, designed in Japanese style with over 280 types of plants conducive to gardening in the Midwest. It is truly a four-season garden with curving paths and pruned trees, framing perfect distant views of lakes, grassy hills, woods and gardens beyond. Like all Japanese gardens, Sansho-En reflects a culture where ancient philosophies are revered. In Japan, symbolism is revered, especially in nature. Traditionally, the Japanese do not like to recreate natural scenery, but instead to suggest it. They frequently use their imagination and spirituality to bring them closer to nature. The Japanese garden is full of symbols: gravel represent water, bushes are pruned into mounds to look like mountains and hills, pine trees reflect a long life, and gravel is raked in the dry garden to reflect the ocean waves breaking onto the shore. The green of shrubs, trees and perennial leaves remains from season to season and symbolizes the lasting quality of nature instead of the shortness of human life. The Japanese garden has many shades of green, especially on cloudy days. The garden is designed to catch the snow, and is truly a year-round garden. Flowers are showcased at special times: crabapples in spring, irises in summer, chrysanthemums in fall. However, the blossoms fade quickly, its life too short to give a sense of enduring quality. Old age is also highly respected in Japan, and in the garden, trees are made to look older by pruning, shaping and training. The guide wires help train the trees to grow in a particular direction, and branches are trimmed yearly. The creation of this living sculpture continues throughout the tree’s life. Boulders are the “bones of the earth” and represent stability. The Arched Bridge – a link between this world and paradise – features the first of 13 lanterns in the garden, and takes you to the first island of Keiunto, The Island of the Auspicious Cloud. This island features The Arbor, the highest point on Sansho-En, and a dry garden of raked gravel. The focal point of the island is The Shoin House, an authentic recreation of a 17th century Samurai summer retreat house. The structure was built in Japan, dissembled and later reassembled at the Chicago Botanic Garden in 1981. The contemplative courtyard was designed for the samurai to view as he works at his desk. The Shoin House is open for public viewing Thursday through Sunday, weather permitting from May through October. The Zigzag Bridge leads visitors from Keiunto to Seifuto, The Island of Pure, Clear Breezes. Seifuto features the Arbor House, called the “The House of Pure, Clear Breezes,” and a dry garden. Seifuto provides a peaceful spot for rest and contemplation. The third island, Horaijima, The Island of Everlasting Happiness, is not accessible by foot and has no constructed objects. It is home to immortal beings who live lives of perfect happiness and peace on this distant, mysterious island. “The Garden of Three Islands”, features a kaiyu-shiki or promenade style garden which reveals its beauty slowly and invites visitors to meander its winding paths. A graceful wooden bridge connects, Keiunto, the southernmost island to the mainland and offers a view of water, reflection, fish swimming, and cool breezes. Keiunto, “The Island of the Auspicious Cloud”, is the highest and largest of the three islands. This island appears as a billowing cloud allowing visitors to gaze down on the other islands. It features a dry garden with a sophisticated garden gate and an arbor. The arbor provides a spot to contemplate, rest, and enjoy the view. Chinese style porcelain stools point to the sophistication and wealth this dry garden exemplifies. Nestled in a cove on Keiunto is the Shoin building modelled after the summer dwellings of feudal lords. It is cantilevered over the water to catch the cool breezes and afford another perspective of the garden. Enclosed by a hedge and a moss garden, the Shoin building is the focal point of Sansho-En. Rolling mounds of azaleas cover an entire hillside on this island and are particularly striking in bloom. A granite zigzag bridge connect Keiunto to the central island of Sansho-En, Seifuto, “The Island of Pure, Clear Breezes”. Seifuto contains a rustic arbor, naturalistic plantings, boat landing stones and various stone lanterns. The dry garden on Seifuto is smaller and more intimate. It features a water basin and an Oribe lantern and a rangui post border. Across the water lies Horaijima, “The Island of Everlasting Happiness”. with a sparsely planted landscape. Due to its symbolic and mystical nature, Horaijima can only be viewed from a distance. It does not have any built structures or artifacts as it represents a place inaccessible to mortals. Early plans for the Chicago Botanic Garden proposed a Japanese Garden to introduce the visitors to another culture’s way of creating gardens, to provide a place of peace and contemplation, and to showcase the best plants for a Japanese style garden in the Chicago area. Work began on Sansho-En in the early 1970s to design and build the islands. The planting phase and the construction of the Shoin building and other structures concluded in the late 1970s and early 1980s.The dedication ceremony took place on September 19, 1982 and was conducted by Reverend Goro Oki. During the 1990s, it became evident that the shorelines of many gardens, including Sansho-en, were experiencing erosion. 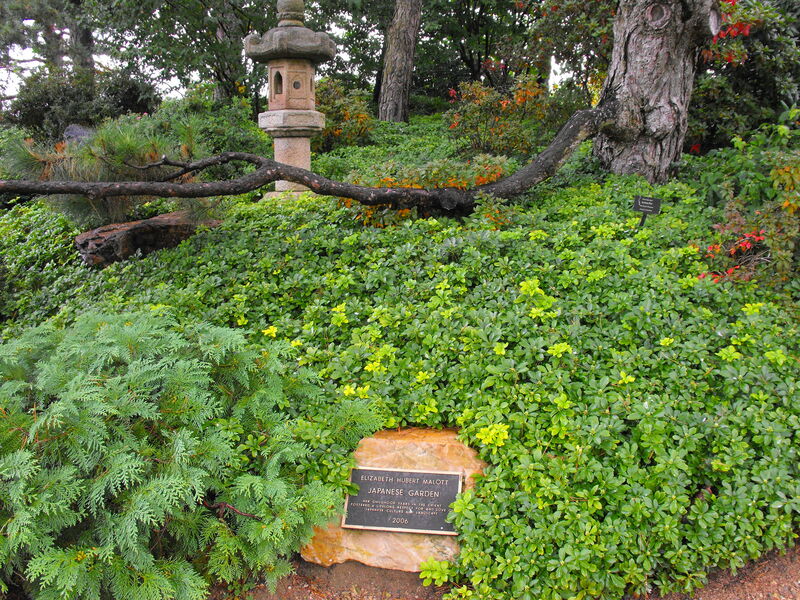 In 2006, at the completion of an extensive shoreline restoration project, Sansho-En was rededicated and named the Elizabeth Hubert Malott Japanese Garden. Garden Designer: Dr. Koichi Kawana was born in Asahikawa, Hokkaido, Japan and immigrated to the U.S. in 1952. He earned a B.S. and M.S. in Political Science from UCLA in 1959 and completed a Master of Fine Arts in Environmental Design in 1964. He later earned a Ph.D. in Landscape Architecture from Pacific Western University. He maintained a long relationship with UCLA as a student, as a teaching fellow for the Art Department, and as a principal architect with the University’s architecture and engineering office. He was a respected professor regularly teaching environmental and landscape design and Japanese art and culture. He was also an accomplished, multi-talented artist, proficient in Japanese design principles and aesthetics. He founded Environmental Design Associates, a Los Angeles based design firm, in 1966. Kawana’s approach to design emphasized regional identity and authenticity. His designs showcased a closeness to nature, simplicity, and attention to the unique local environment. He designed Sansho-En in the kaiyu-shiki style, setting up the views for the visitor and slowly showing the subtleties of a sophisticated and authentic garden. Garden builder: Kumoi Construction Company Ltd. that specializes in building temples, shrines, and historical structures in Japan, constructed the Shoin building, the toolshed adjacent to Shoin building, and the gate and arbor on Keiunto. The landscape contractor in charge of all plantings was Clauss Brothers, Inc. of Chicago. Masonry by Fernando, Inc. of Lake Forest completed the stonework on all the islands.